The purpose of the Scottish Borders Campus is simple – to provide a centre of excellence of learning and development in the Borders region. One centre, but from two independent, highly respected institutions – each retaining their own distinct voice and personality. 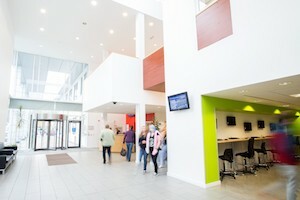 The fully refurbished Campus provides the College with a modern administrative and educational hub, and create for the University, efficient and effective teaching accommodation. A shared site, shared services, and also a shared vision. A vision to inspire, to nurture and to help develop talents and skills, not only for those it caters for, but also the region itself. At all levels and across all boundaries, we want to ignite a passion to deliver success by achieving potential on an individual, organisational, social and economic basis. Our purpose is to inspire confidence and fulfilment as well as a willingness to achieve more, not only on a personal level, but for others too. We want to awaken an unfearing confidence in the future – for the Borders and beyond. Provide a vibrant and harmonious working environment for staff and students of both organisations. Become the first choice for those seeking education, knowledge and learning enhancement in the Borders. Continually increase and grow student numbers. Build and develop partnerships with industry in the Borders and further afield to encourage them to stay in, or move to, the Borders. Become instrumental as a driver for moving to a knowledge-based economy in the Borders increasing GDP per head. Become a community facility that is synonymous as a place to try out new things beyond education. Build on our success and drive more institutions to join the Campus to broaden the range of the post-school educational provision. Establish a seamless link between schools and post-school education in the Borders region and beyond.